Sometimes I play the game 'what would I be if I had to change jobs?' My first profession was a physiotherapist, and I'm currently a PE teacher so it may be a bit of a surprise that the answer is often that I'd become a wedding planner. I love organising and finding amazing, beautiful ideas and finishing touches and I love me a good wedding. 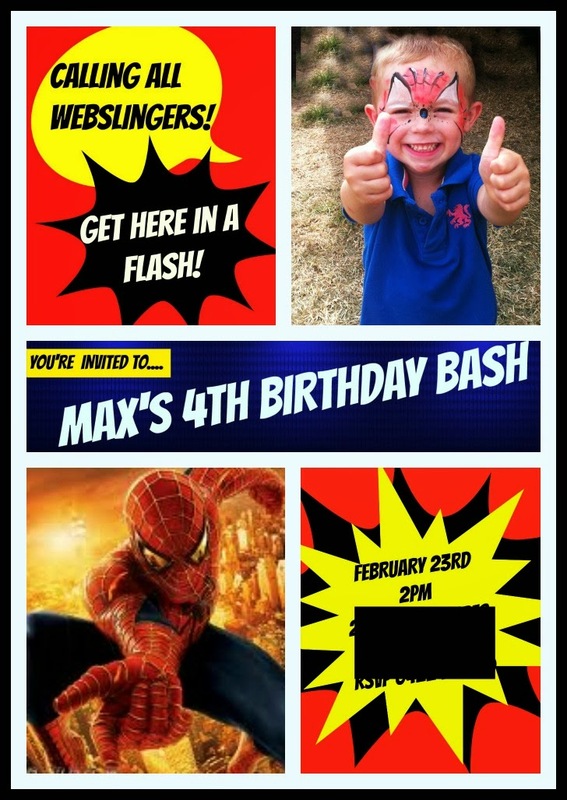 But until I change careers I'll satisfy my itch with planning the boy's birthday parties. 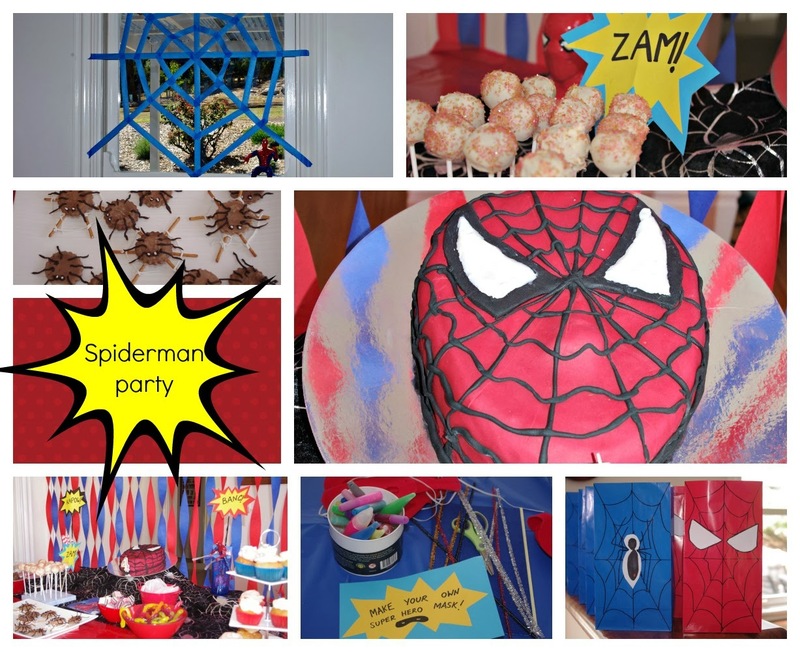 MJ recently turned 4 and we had his Spider man themed party at home. I started browsing Pinterest in the months before (follow me to see my board) to get my ideas and it was a lot of fun going through them with MJ. It made him quite excited about the process and he had surprisingly clear ideas about what he wanted the party to be. I started with the invites and using an example I found online I made them on picmonkey and printed them at kmart for 9c each - bargain! I found cheap red and blue party favour bags at Spotlight, 20 bags cost about $5 (on special) and I used a black texta and paper to decorate. I copied the red design from pinterest and came up with the blue one myself. A local party shop was closing down and I picked up two cake board﻿s, red and blue crepe streamers, 'Turning 4' balloons, Spider man napkins and a number 4 candle for $8. I used the streamers to decorate behind the cake table and added other red, black, blue and white balloons. I picked up half price plastic table cloths from Spotlight and red plates (20 for $2) and red and white paper drinking straws ($2) from The Reject Shop. I had some other red plastic bowls and cups left over from last years party and Christmas. I had a craft activty 'make your own superhero masks' prepared. I purchased red felt squares (60c each x 5) and cut 5 masks from each. I then hole punched each side and added elastic ($2). I found sets of glitter pens and paint pens for $2.50 each at The Reject Shop so the whole activity cost less than $10. It was also really popular, better than I hoped, as every kid made a mask and it was a great first activity as kids just joined in when they arrived. Games: I made a set of twenty cards with different characters from spider man I printed off the internet. They were placed on the ground and each character name was also placed in a hat. We played music and when it stopped each kid had to jump on a character card. If your characters name was pulled out if the hat you were eliminated and went and played 'Pin spidey on the web' which I'd made on a large sheet of grey cardboard and cut a spider man from a greeting card. Again it worked better than I had hoped. Other games included chalk drawing outside, gang chasey and 'Whats the time Mr Wolf?'. Hubby led the running games. The cake table included cupcakes (strawberry and funfetti) and cake pops I made. I picked up a great box cake pop pack with stand and sticks included for $5 at Aldi. I made spiders from caramel crown biscuits and piped chocolate and spiderwebs from pretzels and piped white chocolate. We also had lollies and popcorn and a fruit platter. I decorated with a piece of black spiderweb material from Spotlight and a cool Spider man mug that my MIL found for us. I made call out signs (Zam! Kapow!) from coloured paper and skewers. I was going to use free templates I found on line but my printer was low on ink. After the games we had hot food (party pies, sausage rolls, chicken nuggets and pizza) followed by the Spider man cake I made which I blogged about here. I know it's the best idea for kids. Enjoying and playing at their mate's birthday is really exciting. Blue and red décor is unlike a great idea for my little one's birthday too. But I am also thinking of cricket theme. Quite confused now. Will take help from my cousin to suggest me one of the superb LA venues and some exotic arrangements.